Habit: Annual 5--30 cm; sap milky. Stem: slender, generally openly much-branched, sparsely glandular-puberulent. Leaf: basal, 1--3 cm, spoon-shaped to oblanceolate, entire to dentate or irregularly lobed, teeth often minutely spine-tipped, faces glabrous; cauline reduced, distal scale-like. 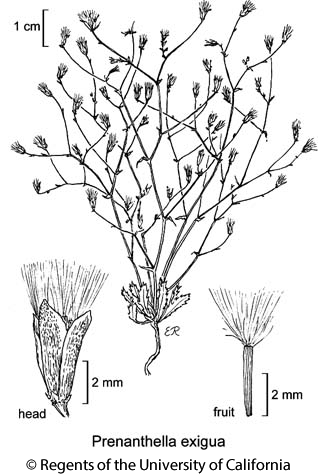 Inflorescence: heads liguliflorous, many, in open, intricately-branched, panicle-like clusters; peduncle slender; involucre cylindric; phyllaries in 2 series, outer 2--3, < 1 mm, deltate, inner 3--5, 3--5 mm, lance-linear, not reflexed in fruit; receptacle flat or +- convex, glabrous, epaleate. Flower: 3--4; ligules 1.5--2 mm, light pink or white. Fruit: 2.5--3.5 mm, cylindric, 5-ribbed and grooved, +- white to pale brown; pappus of 80+ stiff, minutely barbed bristles, 2--3 mm, white. Chromosomes: 2n=14. Citation for this treatment: Kenton L. Chambers 2012, Prenanthella exigua, in Jepson Flora Project (eds.) Jepson eFlora, http://ucjeps.berkeley.edu/eflora/eflora_display.php?tid=4461, accessed on April 25, 2019.